Wild - can subtitute for all symbols except (Gold), (Wood), (Water), ( Fire), ( Earth). All line pay symbols must appear on a played line on consecutive reels. Begin with the far left reel or the far right reel. When 3 or more (Gold), (Wood), (Water), ( Fire), ( Earth) appear , will trigger GOD LISTEN UP bonus game. Five elements: Gold, Wood, Water, Fire and Earth are corresponding to their own " ALL OF A KIND " prize.
" GOD LISTEN UP AGAIN" - If players didn't get any prize in the bonus game, God Listen up bonus will be played again.
" 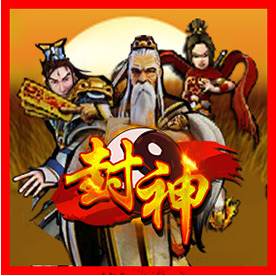 ALL OF A KIND"
Obtain the LingZhu can trigger the " ALL OF A KIND" feature and has chance to win the corresponding prize. If the special symbols appear in the ALL OF A KIND feature game, they will be locked in the screen. The different symbols will respin. This feature will stop if there is no more specials syambols appear. Player has chance to re-spin till all the symbols appear the same. After the winning, player can play " DOUBLE UP" by entering double up game. Press button to start the game. If upper and lower parts make up and match to make a complete image, player will get the corresponding prize, else the winning prize will be zero.